Jesse Miller is the Executive Chef at Washington D. C’s Bar Pilar and its sister establishment, Saint-Ex. 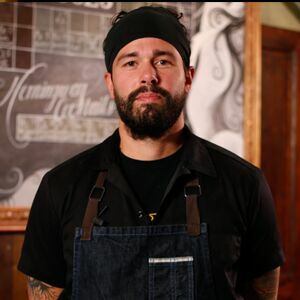 He got his start in the culinary world at the Elkridge Furnace Inn in Maryland, where he worked with Chef Justin Bittner. Jesse brings to diners fabulous farm-to-table dishes that riff on classic preparations in a way that is at once familiar and innovative. Committed to working with the customer when to accommodate allergies, health concerns, and taste preferences, Jesse embraces this challenge with the same sort of enthusiasm with which he embraces combining ingredients in unusual ways. Goi Ga is traditional Vietnamese cabbage salad with soft poached chicken, salty peanuts, crunchy fried shallots, and a spicy sweet dressing. This simple pickling method makes for a visually thrilling appearance and a savory, tart spin on your typical hardboiled egg. Browned butter, or as the French say “beurre noisette,” is what it is- and it is delicious! A rich and creamy country gravy with fresh homemade pork sausage. Delicate shrimp meets buttery grits and smoky bacon in this hearty country classic.